It's taken the better part of a millennia of European civilization for eclecticism to become a recognized and even appreciated style, albeit mostly within the art forms of interior design and fashion. But even within these domains, eclecticism is not without its themes, such as color palette, detail of workmanship, or even comfort. Filmmakers in Hollywood, too, approach script development in an eclectic manner, pitching their new plots as hybrids of well-known films. For example, in the Colorado Shakespeare Festival's current production of Antony and Cleopatra, theatre, television, and film director Robert Benedetti spins his adaptation of the playwright's book as Fatal Attraction meets All the President's Men. Benedetti even manages to edit the arguably unwieldy, surprisingly cinematic script into a cohesive 2 hour and 25 minute (including intermission) story. But the choices he makes in defining what Hollywood describes and the "A" and "B" stories create havoc for this production. As he sees it, the "A" story is about aging and the desperation that results when individuals aren't prepared for this process, and the "B" story is about "old warriors versus corporate demagogues." While these are interesting themes, a recent interview supports the notion that the director has imposed his unsatisfactory experiences in Hollywood on a story with different objectives and characters with different tragic flaws. Granted that Marc Antony had been around since Julius Caesar's reign, and that he is older than Octavius Caesar and Lepidus, but this does not make him past his prime either as a warrior or a lover. Yet in Benedetti's version, he's an aging warrior, occasionally stooped, soft around the middle, and in love with Cleopatra more as a prized object than as a soul-mate equal in stature to himself. The problem with stating Antony's tragic flaw in this manner is that it fails to account for the deep-seated passion and electric chemistry with Cleopatra that must be evident in order to account for his distraction and resulting tactical negligence. Otherwise, Antony becomes a victim of aging, and his loss of virility and encroaching senility drain him of the stature and sexuality this play demands. So, it must be said that despite his well-crafted performance, Michael Kevin, always regal as aging English kings, is miscast as the battlefield warrior and epic lover, Antony. This dissymmetry is further emphasized by his relationship to Enobarbus, who should not be simply his aide, but a mentor of sorts as well—one whose counsel would normally be heeded, were it not for the love of Cleopatra. 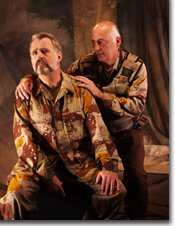 Instead, with Joel Morello's wizened and gravity-laden performance as Enobarbus, we have two men of equal age whose relationship deprives Enobarbus of his stature as an elder tactician, as well as diluting the tragedy of his death in Antony's arms. Kim Staunton, who recently shone in the Denver Center Theatre Company's production of A Streetcar Named Desire, must have thought her tragic Blanche Dubois had died and gone to heaven when she was cast as Cleopatra, Blanche's true calling. And, indeed, she breathes imaginative life into the Queen of the Nile, making her outlandish costumes seem fitting for the living goddess. Her passion for Antony is palpable, even magnetic, yet would have benefited from a few more regal, less emotive, moments. Also, Staunton is intermittently directed upstage, causing portions of her speech to evaporate in the spacious amphitheatre. Against these mixed messages from Antony and Cleopatra, Ryan Spickard's gusto-packed Octavius Caesar is made to seem less the antagonist than he is designed to be, his gangsterism appearing well-organized and decisive. Here, the dictates of Benedetti's "B" story add to the imbalance of the drama, as we watch modern special forces units, led by silk-suited operatives, surround the last Egyptian monarch, while reconnaissance planes buzz overhead. As much as I am sympathetic to the parallels this picture paints with America's own imperial wars, these blatant anachronisms are at odds with much of the original text that remains in the script and its references to ancient military strategy. Simply put, there is too much happening here, and Benedetti's assumption that he must adapt Shakespearean drama to the action-packed football mentality of American culture not only underestimates the intelligence of his audience, but subverts the carefully-crafted artistic sense of the very works he would want such audiences to appreciate. 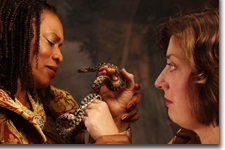 The Colorado Shakespeare Festival's production of Antony and Cleopatra runs in repertory with Romeo and Juliet and The Comedy of Errors at the Mary Rippon Outdoor Theatre at the University of Colorado at Boulder, through August 15th. 303-492-0554.